Open kitchen shelving adds storage and style to the hardest working area in your home. The practice of putting a cabinet door over the practical elements of your cooking space has been an accepted solution to unsightly kitchen clutter for decades. After all, what could be attractive about bowls, plates, pots and platters? Well, it turns out that there's a lot of stylish potential hidden in your cupboards, and getting some of it out on display may give you a decorator look on a budget. Wood cabinets with hinged doors can look great. They can also dwarf a small kitchen, destroy the classic lines of a period kitchen, make the space look dark and unwelcoming, and be a hassle to maintain. Although in many quarters, kitchen cabinets with doors are considered stylish, and a potential increase of the value of your home, there's a growing interest in making the kitchen a more open area by bringing those forlorn objects you're hiding into the light with open shelving. Open shelves, whether their painted to match the walls or not, make a room look larger, and that's good news for small kitchens, dark kitchens and kitchens with low ceilings. Putting in open shelving is a big step. If you're replacing cabinets, the change may negatively impact the resale value of your home. If you don't have shelving yet, or your cabinets are in bad shape anyway, open shelving can add style to your kitchen for much less than adding or replacing cabinets. When adding open kitchen shelving, be sure to choose quality wood, and screw shelving to studs. Kitchen shelving typically has to support a lot of weight, so make sure that your shelves are secure. Shelves should be treated with a sealer to make them moisture tight. Steam can create humidity that will make your shelves swell or worse if they aren't properly treated. Make a detailed plan of your room before you grab a hammer. Wall outlets, the location of studs, windows and appliances will all have an impact on how and where shelves can be installed. Take the time now to make a detailed plan so you won't be surprised later. Don't expect everything to be level, straight and true. The baseboards, counters, ceiling line, molding and existing cabinetry may not be as straight as you expect. When you go to install a level shelf, you may have to make minor adjustments to accommodate or correct other un-level elements in the room. 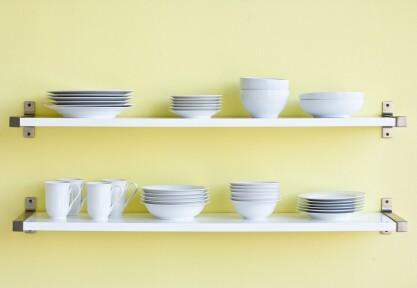 Where eight identical plates don't look as though they have much design potential, stack them and place them next to a coordinating ceramic pitcher and you have a focal point. Basic design incorporates color, texture and form to bring rooms to life. The beauty of open shelves is that you probably already have all the elements you need to make a unique and cohesive design statement and use them to advantage. Wicker, ceramic, glass and metal offer color, texture and sparkle, to say nothing of a few surprises. Transforming open shelves from utility shelving into a design showcase is a matter of aggregating elements into pleasing groups. Through a little trial and error you'll find a series of arrangements that work as storage and decoration. Okay, so you may not want to display your plastic storage containers or cereal boxes, but if you have some concealed storage and can organize things by color, height and texture, open kitchen shelves may be just what you're looking for. Keep it clean. If your range hood doesn't vent to the outdoors, you'll probably be doing a bit more cleaning than you would otherwise, especially if you do a lot of frying or grilling indoors. To keep cleanup to a minimum and avoid grease on your clean dishes, replace range filters regularly and cover pans with grease guards when cooking. Bring on some light. Even if you have spectacular arrangements on your shelves, they won't shine unless people can see them, so invest in good lighting. Track lights will help spotlight the areas you want to highlight and can be inexpensive and easy to install. Organize with on-shelf concealed storage to control clutter. A coordinated group of wicker or canvas baskets will keep small items corralled and contribute to a trim and pulled-together look. Use repetition. With so much stuff in view, keep your space from looking like a jumble sale by choosing themes, like colors and textures, to use in a number of highly visible locations. Don't forget function. Storing your pans on the opposite side of the room from the stove is a bad idea. Keep function in mind when putting together your layout. Will everything work from a practical and design perspective? Well, probably not on the first try. You'll have to make a series of compromises to get a look and layout that will work over time. Stay organized. With many things out in plain view, your open shelves will only look good as long as you maintain them. A few canted or misplaced items will spoil your careful groupings fast, so set aside some time to keep everything looking organized.